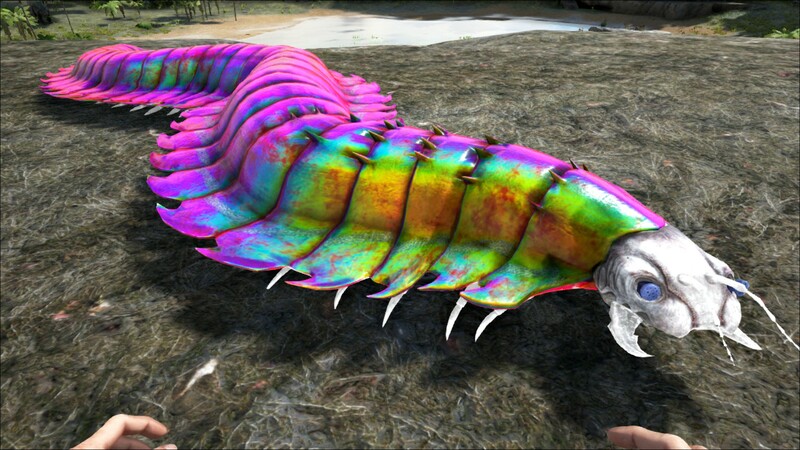 The Arthropluera (ar-thro-plur-ah) is one of the Creatures in ARK: Survival Evolved. The fact that this creature exists is enough to give me nightmares. Like the island's other Arthropods, Arthropluera Felsanguis has become much larger than I might have believed possible. It's a very aggressive hunter, but prefers to eat meat after it has rotted for some time, and will voraciously seek out such delicacies. Arthropleura's blood has a very low pH, to the point that it can dissolve many materials. This acidic blood splashes back on anything that directly attacks it, weakening the durability of weapons and hurting attackers. Many creatures thusly refuse to prey on Arthropleura, fearing this unique defense. If that wasn't enough, Arthropleura also keeps a small reservoir of blood ready to spit at its prey. Like most of the arthropods on the island, Arthropleura is simple minded and relatively easy to tame. It is an almost entirely military mount, useful mostly for attacking at a distance. Thanks to its unique defenses, whether hunting or warring, Arthropleura is generally safe from all but the largest of creatures. Arthropleura are tamable with rotten meat and if wild will attack with acid spit (1 acid spit after melee bite). Be careful as it can hit you with its acid even when it has turned around. The Arthropleura felsanguis is one of the island's most nightmarish native invertebrates - a predatory, heavily armored centipede longer than three men tall. Preferring carrion over live prey, these huge arthropods inhabit the deeper caves of the island, devouring bats and other invertebrates. Their greenish blood has an unusually low pH, a trait that, by self-rupturing delicate vessels in its head, the Arthropleura can use as a rather gruesome defense mechanism. The Arthropluera's carapace has a prismatic effect that causes the colors of regions 0 and 4 to not display exactly as the color it is set as. This section displays the Arthropluera's natural colors and regions. For demonstration, the regions below are colored red over an albino Arthropluera. The colored squares shown underneath each region's description are the colors that the Arthropluera will randomly spawn with to provide an overall range of its natural color scheme. Hover your cursor over a color to display its name and ID. For example, "cheat SetTargetDinoColor 0 6" would color the Arthropluera's "segments" magenta. 5The Arthropluera is incapable of drowning. 5The Aberrant Arthropluera is incapable of drowning. 5The Corrupted Arthropluera is incapable of drowning. Arthropluera is tamed non-violently, rather than through the use of tranquilizers. Since it is a naturally aggressive creature, you must first apply Bug Repellant in order to keep it from attacking you on sight. The Arthro will not be tameable if it is trying to attack another creature or is feeding on a corpse, so you must remove any such distractions from the area, or lure the Arthro to a more secluded area. Once you have the repellent applied and distractions dealt with, place the food you wish to feed it in the right-most slot of your hotbar. Then, carefully approach the Arthro until the button prompt to feed it appears - it will eat the piece of food you give it and a taming bar will appear. You must then wait until it becomes hungry enough to be fed again, and repeat the process. It can be very difficult to properly do this, as the Arthro is constantly moving in an unpredictable pattern. If you accidentally get too close and touch the Arthro, it will become aggressive and attack, despite the repellant. In order to continue taming it, you must get far enough away for it to lose interest in you. If you go away from it for too long and aren't using broth of enlightenment to tame it; it's taming bar will go down faster than you can feed it, making it untameable. Be careful of its spit attack when fleeing, as it will deal significant damage to your armor if it hits. 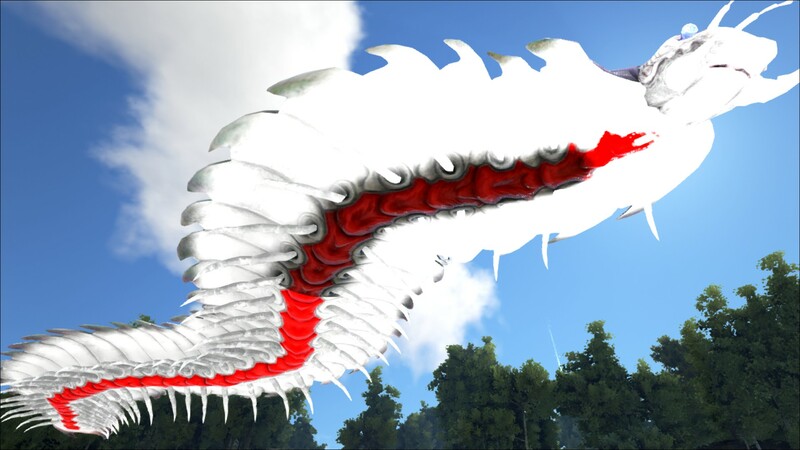 On The Center, one can simply fly an Argentavis or larger down into the East Lava Cave's entrance and carry an Arthro back out in seconds. Avoid attacking it while carrying, due to the melee rebound damage, however. To trap the Athropleura is quite difficult as it breaks though most structures quite well. The best approach found on an official PVE server is to use the passive taming method with the bug repellant and ghillie armor. However, it's assumed that most people would tame one on an official PVP server due to its useful acid and jaw damage. Another way to tame on both PVE and PVP is to use a megalosaurus with bug repellant and ghillie and get close to grab. The athropleura shouldn't be agroed as long as you dont touch it. You can bring it outside and ask a tribemate to pick you up on a quetz and take you to a more secure location or you can take it there while in the mouth of the megalosaurus. If you want to trap the athropleura be prepared for the cost and speed in which you must do this You can trap the athropleura by placing 4 fence posts around it while you have ghillie or bug repellant active. while this happens the athropleura like before would not get angry as long as you keep your distance. you can also ensnare the athropleura in a large bear trap as you do this however it can be buggy and will turn as soon as you have trapped it in the structure run out of the cave and wait a while to let the creature calm down. Then comeback anytime to find that it is waiting there ready for you to passively tame without the fear of accidentally stepping over it and aggravate it. This section describes how to fight against the Arthropluera. Arthropleura appear in caves, so wandering above ground will keep any player safe. However, in caves, they become a very deadly adversary. Melee weaponry and armor simply vanish in any battle with the creature due to its corrosive and acidic blood. To avoid the loss of your armor and melee weapons, stay as far away from it as possible, but keep in mind it can still launch acidic projectiles. Be alert at all times when in a battle, as the cave ecosystems often bring other hazards. One risky fighting method is to keep backing away while using a ranged weapon that won't kill you. Back jump when it is about to bite and side jump to avoid spit attacks. If you are mobile enough, you will dodge his attacks. Ranged weapons are advised to avoid the weapon and health damage caused by melee attacks. Melee should only be used as a last resort. A Compound Bow can usually kill lower levels with 3-4 headshots. Melee attacks against the Arthropluera will significantly reduce weapon durability and cause damage to the player. One well-aimed shot from the creature will strip a player of his/her armor(or bring it very close to breaking point). Make sure you spot them in advance, so they do not get the first hit in. Their spit can also hit you while riding a mount and can still break your armor, the spit does a good bit more damage without armor on. As of version v280.130, Arthropluera can damage any form of structures. 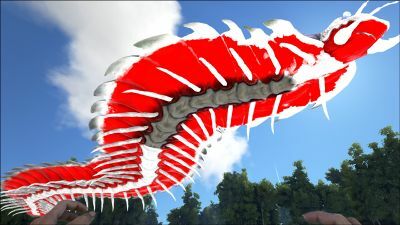 This alone makes it a rather dangerous creature to spawn close to the base as it will immediately try to break through the walls of the structures. It is also a bad idea to use structure as a wall just to kill it. It has a fairly large and long body, so you can spot (and shoot) one easily. The Arthropluera has a 2.5x headshot multiplier. They are also affected by 5x explosive multiplier. It stops to spit and bite; giving you a few seconds of grace. Large turn radius for a moment. Brace yourself once its aim snaps back on you. Base defender: During a raid, Arthroplurera can hold off unmounted raiders before they begin planting explosives. With the armor corroding acid against unmounted players, Arthropluera will play a vital role in raid defense. (Level up Melee Damage and Movement Speed). 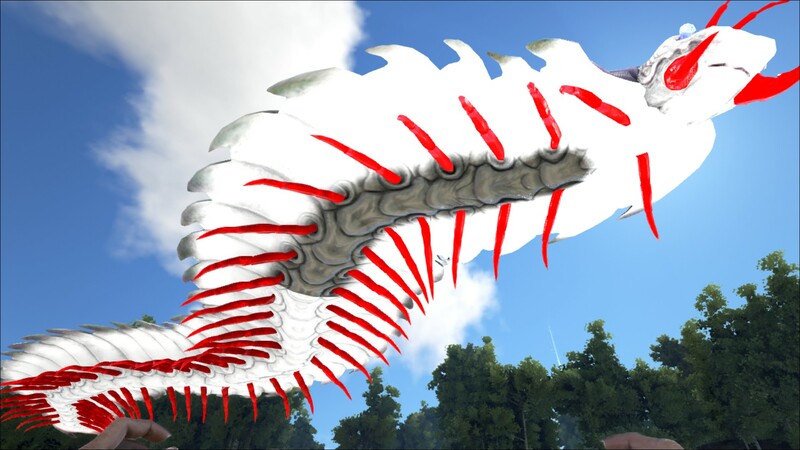 Base Destroyer: As of version v280.130 on PC, Arthroplueras can now damage stone, metal, and even Tek structures with their melee attack. While they are rather fragile against enemy defenses along with this same patch (5x more damage taken from explosives and 3x more damage taken from ranged attacks), they can be a primitive way to bring down advanced bases once enemy turrets have been destroyed. Damage Test on Official Server with a level 225 Arthropluera with 455% Melee damage. Just using the left click melee attack. Thatch Foundation: Destroyed in one hit, ? at 100% melee. ? x regular damage (untested at base damage). Wood Foundation: 1,125 damage, 247 at 100% melee. 13.72 x regular damage. Stone Foundation: 574 damage, 126 at 100% melee. 7 x regular damage. Metal Foundation: 282 damage, 62 at 100% melee. 3.44 x regular damage. Tek Foundation: 113 damage, 25 at 100% melee. 1.39 x regular damage. Cave mount: When mounted you don't aggro any creatures. That makes this tame ideal for caving. Even when attacking most creatures won't aggro on you. This might be a bug. The dossier lists Arthropluera as being from the Permian period, but it was actually from the Late Carboniferous. The Dossier was revealed on 9/11/15 on Steam. 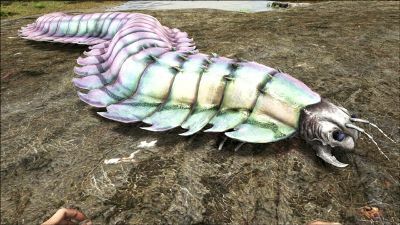 In real life, Arthropleura ate rotting plant matter instead of rotting meat. It also lived in the Late Carboniferous as well as the Early Permian. The species name roughly means "poisonous blood", but is incorrectly constructed; it should be fellisanguis. The Dossier misspells Arthropleura as Arthropluera. Presumably this is a typo by the author. The Dossier says that Arthropluera is "...An almost entirely military mount..." But next to the icon that represents it as being rideable there are question marks. - These question marks might represent the writers query as to whether or not the Arthropluera is capable of being saddled, not necessarily the capability of one being ridden. It might be a good idea to bring a saddle within the cave once you have spotted the Arthropleura you want to tame. They can get stuck if you set them on follow. The Arthropluera can breathe underwater. One of the only two tameable creatures that can break TEK structures. This page was last edited on 14 April 2019, at 20:53.